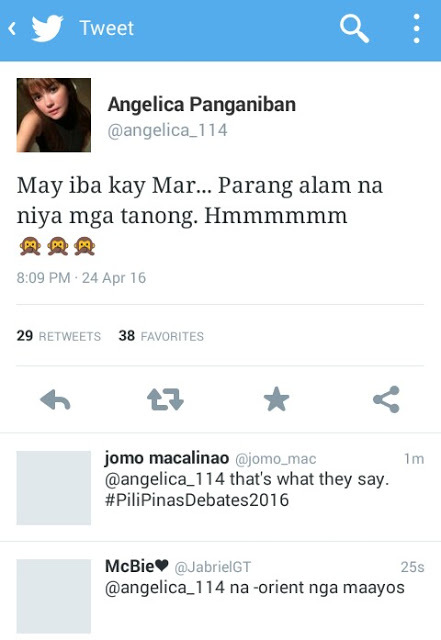 Angelica Panganiban delivers a mysterious message saying that the Final Presidential Debate 2016 was biased to Mar Roxas! Read This! Home / News / Angelica Panganiban delivers a mysterious message saying that the Final Presidential Debate 2016 was biased to Mar Roxas! Read This! The recently concluded Final Presidential Debate was hosted by ABS-CBN. They have managed to make it happen despite the controversies before that it will be unfair since the Kapamilya Network is supporting the Liberal party standard bearer Mar Roxas. The total flow of the said debate that happened at the University of Pangasinan last April 24, 2016 was smooth sailing. 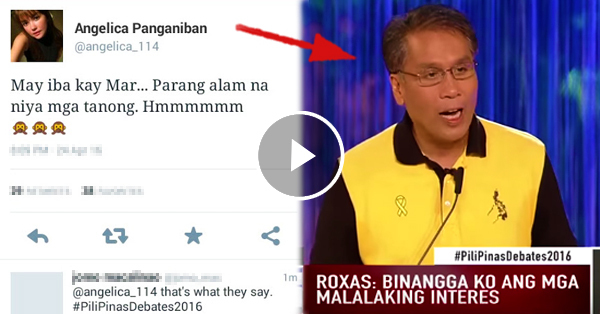 But the netizens could not help but notice that Mar Roxas confidently answered every question. In line with that, many people assumed that he might have known the question even before the event happened. One of the celebrities that said the same thing was Angelica Panganiban. Her mysterious message was posted in Twitter. People have been using the hashtag of #ABIASCBN because of the incident.